This sumptuous page, The Court of Gayumars (also spelled Kayumars— see top of page, details below and large image here), comes from an illuminated manuscript of the Shahnama (Book of Kings)—an epic poem describing the history of kingship in Persia (what is now Iran). Because of its blending of painting styles from both Tabriz and Herat (see map below), its luminous pigments, fine detail, and complex imagery, this copy of the Shahnama stands out in the history of the artistic production in Central Asia. The Shahnama was written by Abu al-Qāsim Ferdowsi around the year 1000 and is a masterful example of Persian poetry. The epic chronicles kings and heroes who pre-date the introduction of Islam to Persia as well as the human experiences of love, suffering, and death. The epic has been copied countless times—often with elaborate illustrations (see another example here). This particular manuscript of the Shahnama was begun during the first years of the 16th century for the first Safavid dynastic ruler, Shah Ismail I, but was completed under the direction of his son, Shah Tahmasp I in the northern Persian city of Tabriz (see map below). The Safavid dynastic rulers claimed to descend from Sufi shaikhs—mystical leaders from Ardabīl, in northwestern Iran. The name “Safavid” stems from one particular ancestral Sufi, named Shaykh Safi al-Din (literally translated as “purity of the religion”). Over a two-hundred-year span starting in 1501, the Safavids controlled large parts of what is today Iran and Azerbaijan (see map below). The Safavids actively commissioned the building of public architectural complexes such as mosques (image below), and they were patrons of the arts of the book. In fact, manuscript illumination was central to Safavid royal patronage of the arts. It is often assumed that images that include human and animal figures, as seen in the detail below, are forbidden in Islam. Recent scholarship, however, highlights that throughout the history of Islam, there have been periods in which iconoclastic tendencies waxed and waned.1 That is to say, at specific moments and places, the representation of human or animal figures was tolerated to varying degrees. There is a long figural tradition in Persia—even after the introduction of Islam—that is perhaps most evident in book illustration. It is also important to note that, unlike the neighboring Ottoman Empire to the west who were Sunni and in some ways more orthodox, the Safavids subscribed to the Shi’i sect of Islam. It was then when Gayumars became the King of the World. He first built his residence in the mountains. His prosperity and his palace rose from the mountains, and he and his people wore leopard pelts. King Gayumars (detail), Sultan Muhammad, The Court of Gayumars, c. 1522, 47 x 32 cm, opaque watercolor, ink, gold, silver on paper, folio 20v, Shahnameh of Shah Tahmasp I (Safavid), Tabriz, Iran (Aga Khan Museum, Toronto). In this folio (page), we can see some parallels between the content of the calligraphic text and the painting itself. Seated in a cross-legged position, as if levitating within this richly vegetal and mountainous landscape, King Gayumars rises above his courtiers, who are gathered around at the base of the painting. According to legend, King Gayumars was the first king of Persia, and he ruled at a time when people clothed themselves exclusively in leopard pelts, as both the text and the represented subjects’ speckled garments indicate. 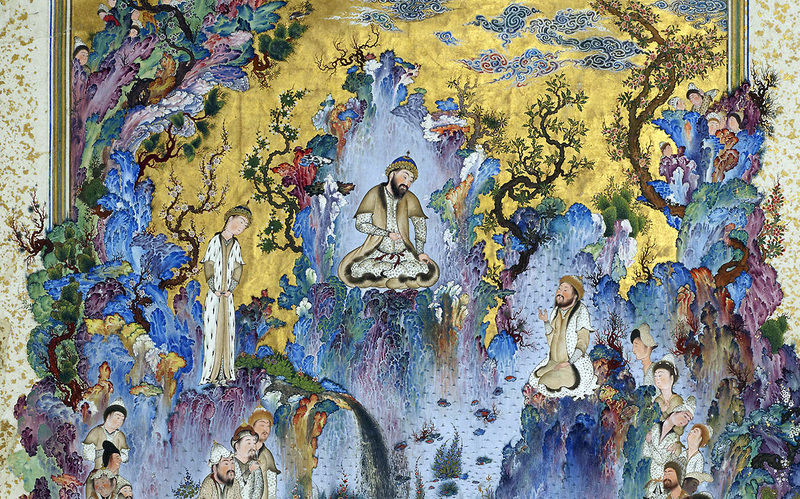 Perched on cliffs beside the King are his son, Siyamak (left, standing), and grandson Hushang (right, seated).11 Onlookers can be seen to surreptitiously peer out from the scraggly, blossoming branches onto King Gayumars from the upper left and right. The miniature’s spatial composition is organized on a vertical axis with the mountain behind the king in the distance, and the garden below in the foreground. Nevertheless, there are multiple points of perspective, and perhaps even multiple moments in time—rendering a scene dense with details meant to absorb and enchant the viewer. One might see stylistic similarities between the swirling blue-gray clouds floating overhead with pictorial representations in Chinese art (image above); this is no coincidence. Persianate artists under the Safavids regularly incorporated visual motifs and techniques derived from Chinese sources.12 While the intense pigments of the rocky terrain seem to fade into the lush and verdant animal-laden garden below, a gold sky canopies the scene from above. This piece—in all its density color, detail, and sheer exuberance—is a testament to the longstanding cultural reverence for Ferdowsi’s epic tale and the unparalleled craftsmanship of both Sultan Muhammad and Shah Tahmasp’s workshops. 1. See Christiane Gruber, “Between Logos (Kalima) and Light (Nūr): Representations of the Prophet Muhammad in Islamic Painting,” Muqarnas 16 (2009), pp. 229-260; Finbarr B. Flood, “Between Cult and Culture: Bamiyan, Islamic Iconoclasm, and the Museum,” The Art Bulletin 84, 4 (December 2002), pp. 641-659; Christiane Gruber, “The Koran Does Not Forbid Images of the Prophet,” Newsweek (January 9, 2015). 2. For a helpful analysis of the historiographic ascription of the term ‘classical’ to Persian painting and the cultural hierarchy that was established largely by scholar-collectors in the nineteenth and early twentieth century, see Christiane Gruber, “Questioning the ‘Classical’ in Persian Painting: Models and Problems of Definition,” in the Journal of Art Historiography 6 (June 2012), pp. 1-25. 3. David J. Roxburgh, “Micrographia: Toward a Visual Logic of Persianate Painting,” RES: Anthropology and Aesthetics, no. 43 (Spring 2003), pp. 12-30. 4. Sheila Canby affirms Stuart Cary Welch’s estimate that it took Sultan Muhammad and his workshop three years to complete the Court of Gayumars illustration. Sheila Canby, The Golden Age of Persian Art, 1501-1722 (New York: Abrams, 2000), p. 51. 5. David J. Roxburgh, “On the Brink of Tragedy: The Court of Gayumars from Shah Tahmasp’s Shahnama (‘Book of Kings’), Sultan Muhammad,” in Christopher Dell, ed., What Makes a Masterpiece: Artists, Writers and Curators on the World’s Greatest Works of Art (London; New York: Thames & Hudson, 2010), pp. 182-185; 182. The text was subsequently possessed by Baron Edmund de Rothschild and then sold to Arthur A. Houghton Jr, who in turn sold pages of the book individually. 7. This expression denotes the beginning of spring. 8. I am grateful to Dr. Alireza Fatemi for generously providing this translation. 9. Roxburgh, “On the Brink of Tragedy,” p. 182. Cite this page as: Dr. Nancy Demerdash, "The Court of Gayumars," in Smarthistory, January 6, 2017, accessed April 19, 2019, https://smarthistory.org/the-court-of-gayumars/.